In middle school and high school we sweated through countless pom practices and work outs together. She loved me even when I had no hair. Though we went to separate colleges, we remained close as always. She was co-maid of honor in our wedding, and I was the same in hers. When she called me one evening in June of 2008 and I answered in the middle of a contraction, she immediately drove to the hospital and stayed there all night until our little man arrived at 5:02 am. She spoke at my dad’s celebration of life. She’s been with me through literally everything, and I have few memories of life without her in it. This is just a handful of the countless great times we’ve shared, so to say I’m excited about the upcoming arrival of her sweet baby girl is a huge understatement. When I asked Amanda what sort of baby shower she wanted, she left it all up to me. 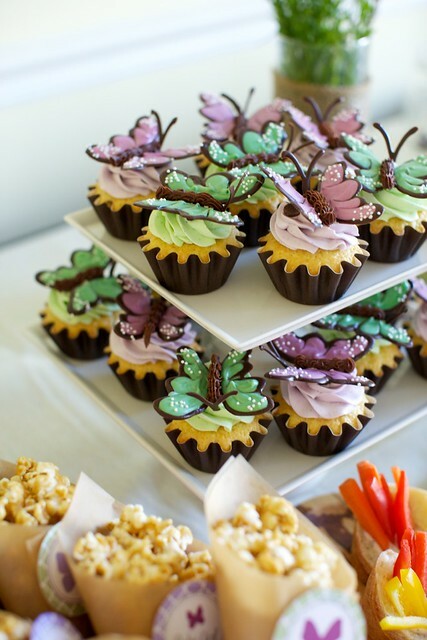 The only request she had was that I somehow incorporate the infamous butterfly cupcakes because she has always loved them. 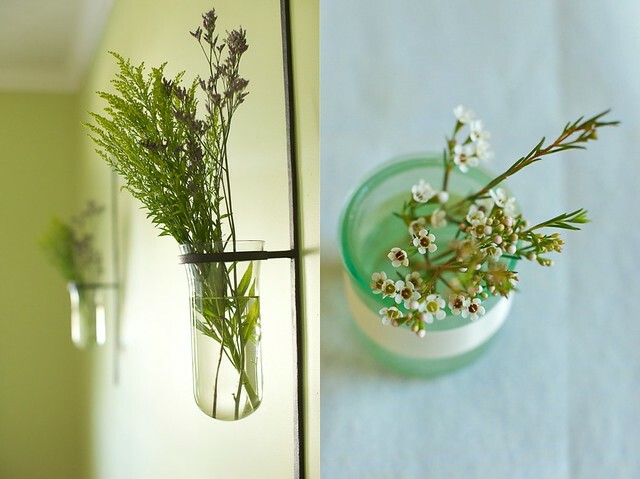 I started brainstorming and this is what I ended up with – a lavender and light green butterfly garden shower. 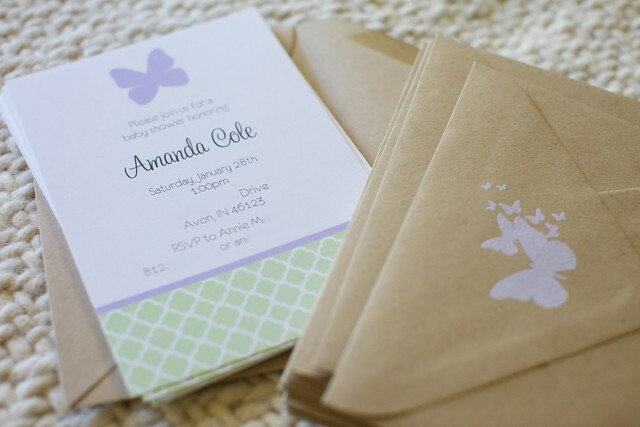 The fabulous ladies of The TomKat Studio coordinated with me to create party printables for the occasion, including this simple and lovely invitation. Since the shower was held in January and there was a dusting of ice and snow covering our sidewalk, a pretty outdoor garden party was not an option. 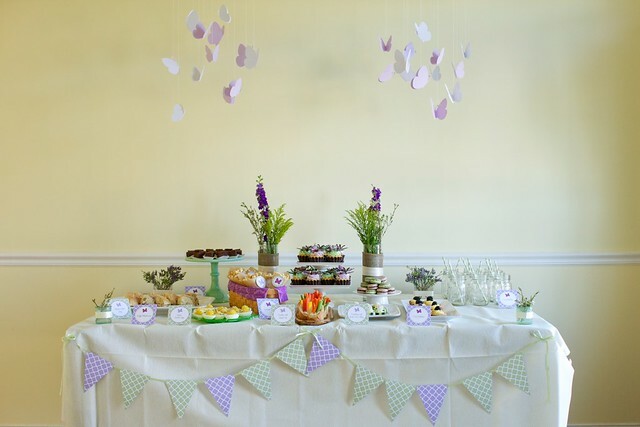 I did my best to create a lush, whimsical setting indoors with lots of florals in lavender, green, and white. (An added plus is that since these sort of flowers are typically used for filler, they are a very economical choice. I was able to do a lot for very, very little.) I banded some of the vases with a strip of burlap and cream satin ribbon, adding a shabby chic touch. I also love-love-loved this pretty welcome sign. Rather than hanging it on the door as I often do, I borrowed a picture frame that is usually on my desk at work to display it. It fit right in with the overall look of the decor. I made the butterfly cupcakes as outlined in my original post about them. 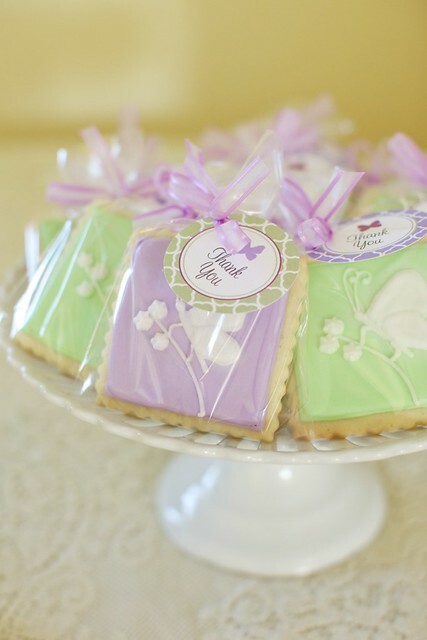 Since the shades of green and purple I was aiming for were much more muted than those of the candy melts sold in stores (at least the stores in my area), I mixed in some white candy melts to help achieve the proper shade. It worked very well. 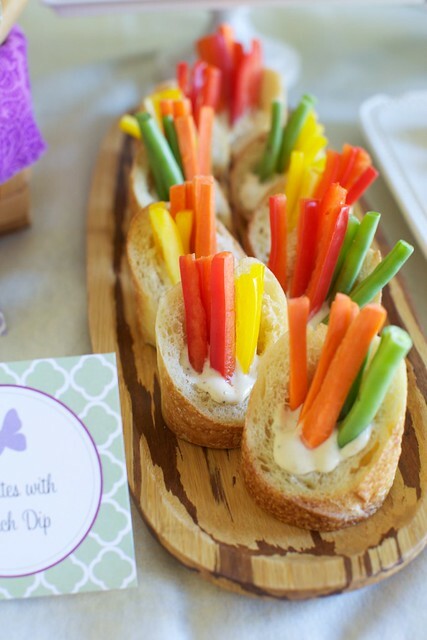 I saw this idea for serving veggies and dip in a baguette cup on Pinterest. How cute is that?! I used my favorite homemade baguette recipe and it worked very well. They are just the right size for something like this. 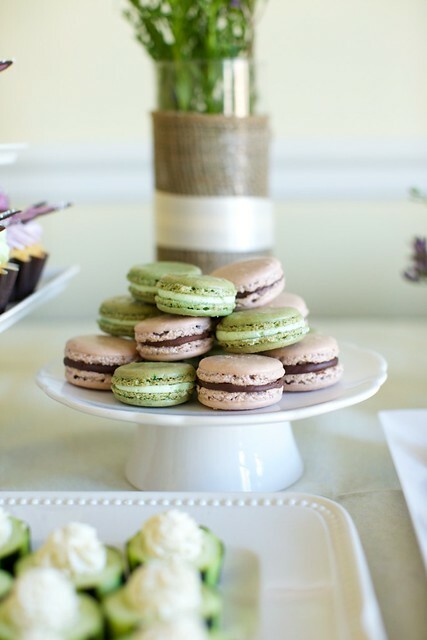 Oh, macarons. Why do you have to be so darn cute? And of course, you know I find every opportunity to make caramel corn. 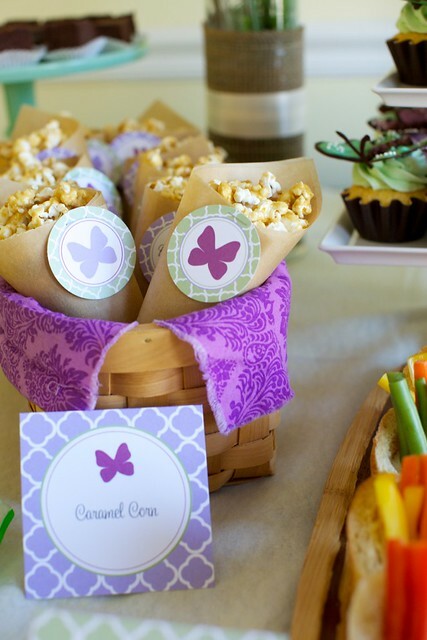 I thought these little parchment cones were a fun way to serve it, and the small party circles prettied up the cones. 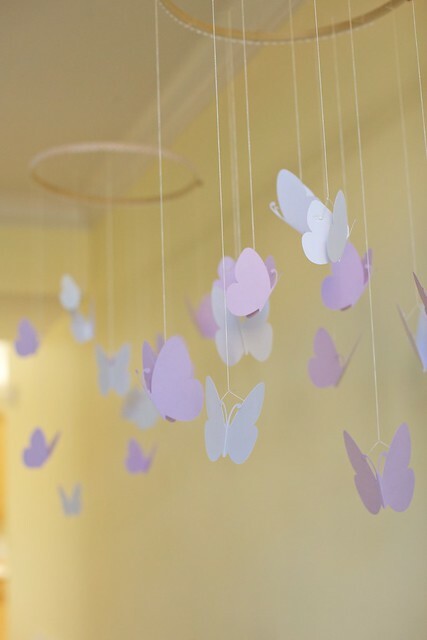 Without a doubt, my favorite detail of all was the pair of butterfly mobiles I created to hang over the food table. I dreamed up the idea but then found it quite a challenge to execute. I ended up purchasing butterfly die cuts in a variety of sizes to match the color scheme, but I still wasn’t quite sure what to hang them from. I wandered around the craft store for quite a while looking at every potential option and just when I was ready to give up, I saw these two large embroidery rings. The rings only cost $4 total and are extremely lightweight, making them ideal for hanging from the ceiling without a hassle. I hot glued a length of lace around the outside of the rings after I had tied on all the butterflies to add a finishing touch. I loved them! In fact, I may make something similar when we decorate Caroline’s big girl room. 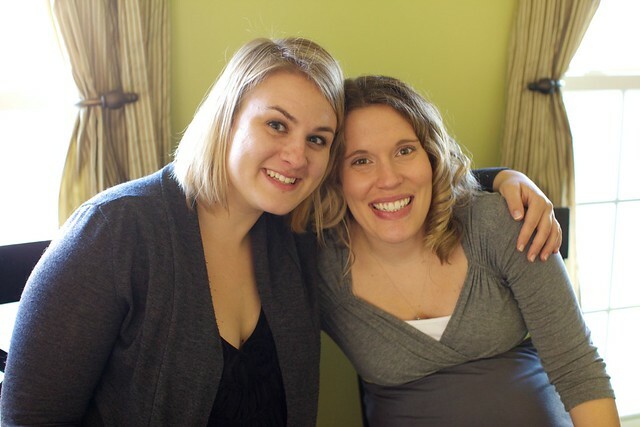 One of the most fun parts of the shower was a pretty big surprise for Amanda. Lena, one of her great friends and college roommates, flew in from Colorado for the shower. Amanda had no idea she was coming. Lena stayed with us the night before the shower and when Amanda showed up, she went out the back door and around to the front to ring the bell. The look on Amanda’s face was priceless! Way to go, Lena. Such fun. So glad you could be there. How cute is she?! Oh, I cannot wait to meet this sweet baby. This has to be one of my favorite pictures ever. Amanda’s mom Lucy has been like a second mom to me as long as I can remember. 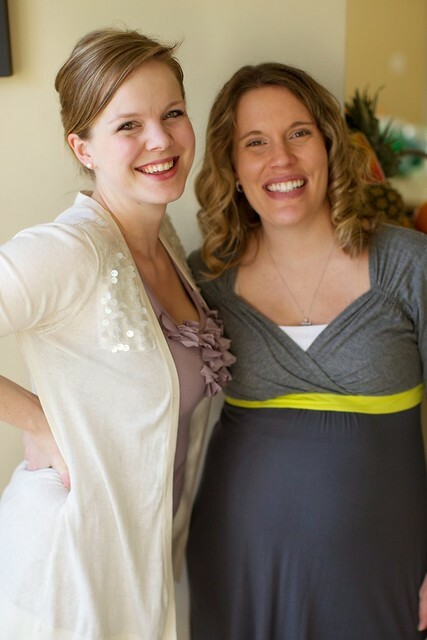 When my own mom was ill and after she passed away, Amanda’s family always welcomed me as one of their own. When Dad died unexpectedly on Thanksgiving, Amanda’s parents were already waiting at the house when I was finally able to get home. Lucy is one of the most kind and generous people I have ever known, and I have always treasured both my relationship with her as well as the relationship between her and Amanda. Since I didn’t get to spend nearly enough years with my own mom, I didn’t have the full experience of a mother-daughter relationship but I have watched theirs very closely and have said many, many times that I hope I can be a mom to Caroline just the way Lucy has been to Amanda. Oh gosh, I’m getting all misty just thinking about this. Enough. Thanks for letting me share this shower and these people who are so dear to my heart. It was an honor hosting!